Per MLB Trade Rumors, MLB has told McCourt that the Fox deal will not be approved. Dodgers owner Frank McCourt was notified today that MLB will not approve the 17-year television rights contract with Fox, reported Yahoo's Tim Brown. Bud Selig's decision comes as no surprise. Now, McCourt's divorce settlement is off and the Dodgers are unlikely to meet payroll at the end of the month. If the Dodgers cannot meet their payroll obligation, MLB will seize and sell the Dodgers, though perhaps not without a legal battle from McCourt. In celebration, check out this Academy Award Winning Best Animated Short Film by Don Hertzfedlt called Rejected. Hold on there. Bill Shaiken tweets that MLB has not notified McCourt of anything yet. Is this a valid leak or just a rumor that is starting to spread throughout the internet like wildfires? I guess we are on to the next stage. Here is the official Press Release from MLB. Them are fightin' words! Here is a statement from McCourt's lawyers. “We are extremely disappointed with the Commissioner’s rejection of the proposed FOX transaction which would inject $235 million into the Los Angeles Dodgers. As Commissioner Selig well knows, this transaction would make the Dodgers financially secure for the long term and one of the best capitalized teams in Major League Baseball. “For weeks Major League Baseball has consistently made public pronouncements asserting that Jamie McCourt’s agreement of the Fox transaction also was needed; that the Court adjudicating the McCourt divorce grant its approval of the transaction; and the Dodger organization provide all data requested by Major League Baseball to satisfy the so-called investigation ordered by Commissioner Selig last April – the latter also being the excuse he gave at that time for delaying his approval of the proposed FOX transaction. “All the requirements for the Commissioner to approve the FOX transaction were put in place by last Friday: Frank and Jamie McCourt entered into an agreement based on the proposed transaction; the Court ordered, among other things, that the FOX transaction is “in the best interest of the Los Angeles Dodgers and should be consummated immediately;” and all information requested by Major League Baseball under its so-called investigation has been provided by the Dodgers. I recently received my winnings from the case break I participated in through the "A Cardboard Problem" case break. Check out the Dodger base cards and various short prints below. Here are the Dodger base cards in the Series 2 set. 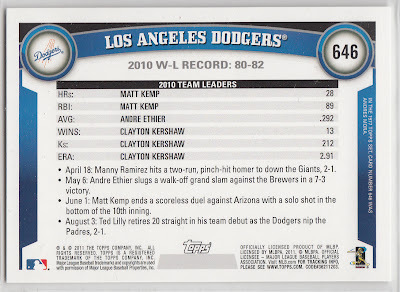 Of the 9 cards above I really liked the card back from the Matt Kemp card. See it below. 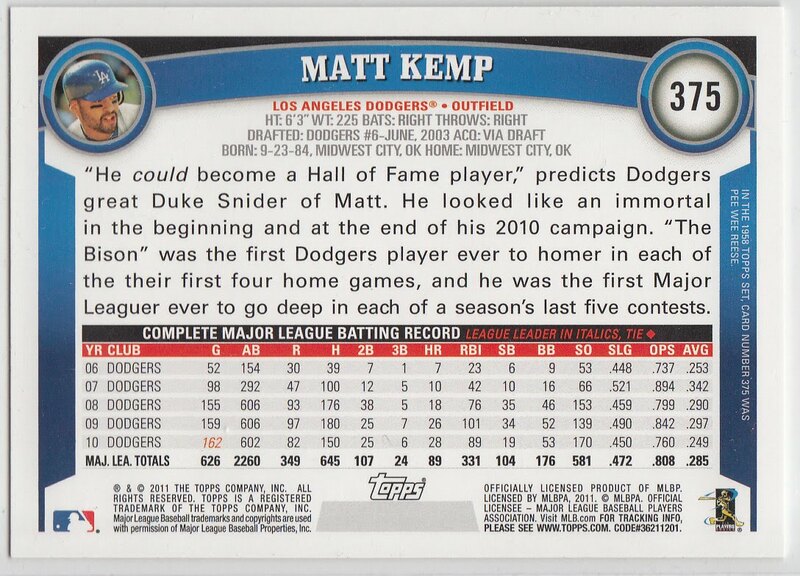 How can you go wrong with Duke Snider calling you a potential Hall of Famer, and considering the kind of season Kemp is having so far I think he is well on his way. Here is the coolest Dodger base card. 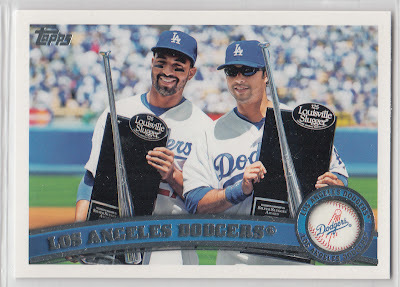 It is the Dodger team card featuring both Kemp and Andre Ethier with their Silver Slugger Awards. 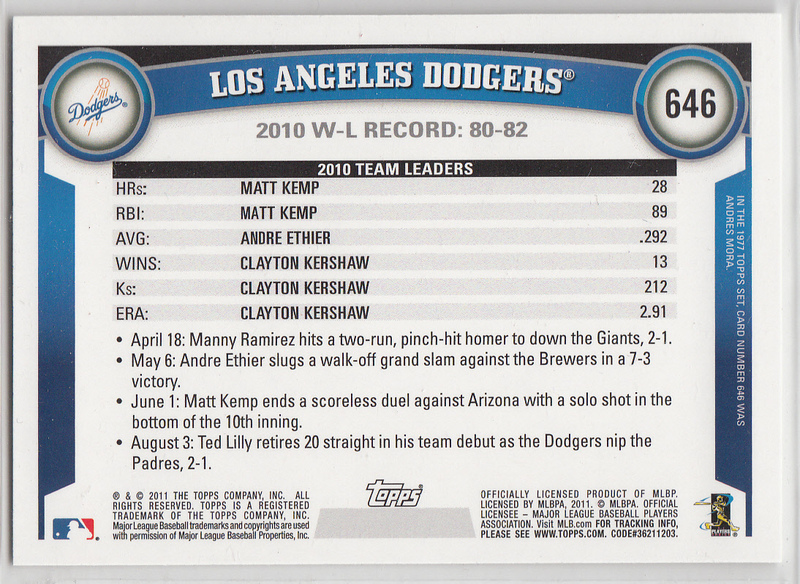 This is the reverse of the Dodger team card. 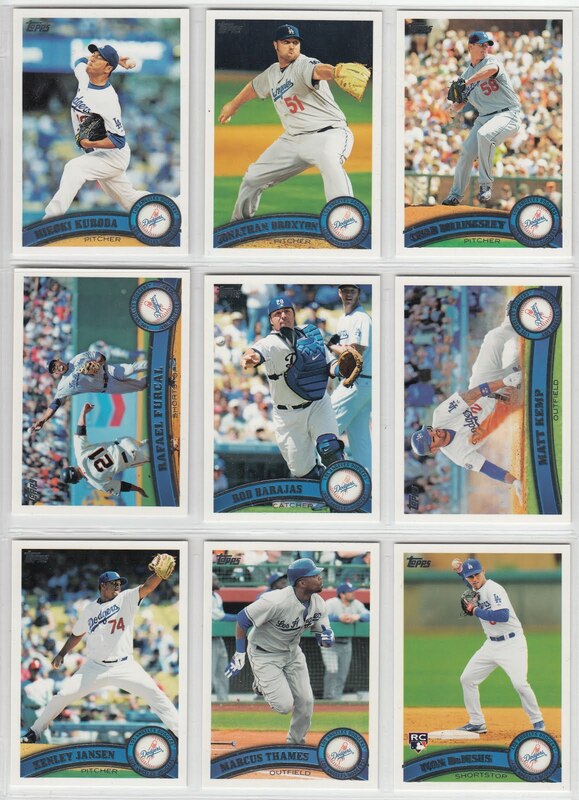 In the Series 2 set there are 25 short prints of future and current Hall of Famers. I was fortunate to get the Sandy Koufax short print in the case break, but missed out on the other two Dodgers available- Pee Wee Reese and Duke Snider. 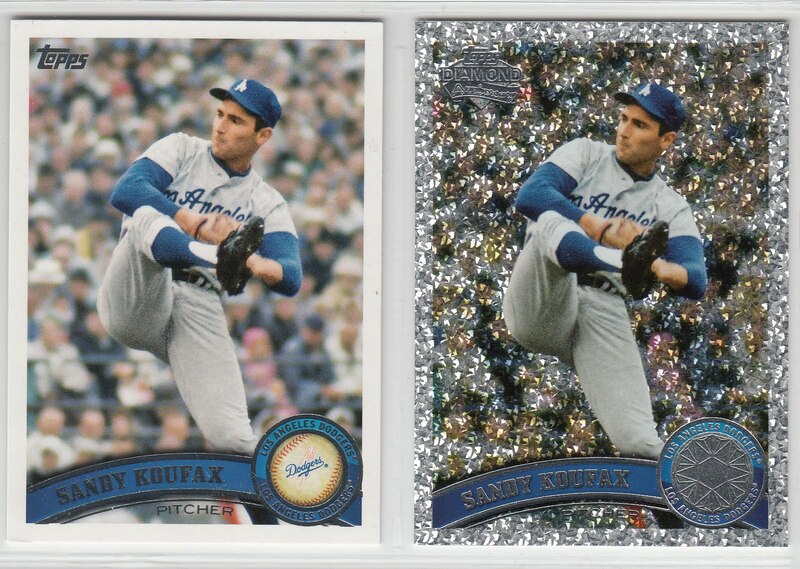 I also received the Koufax Platinum Diamond Anniversary. See them both below. 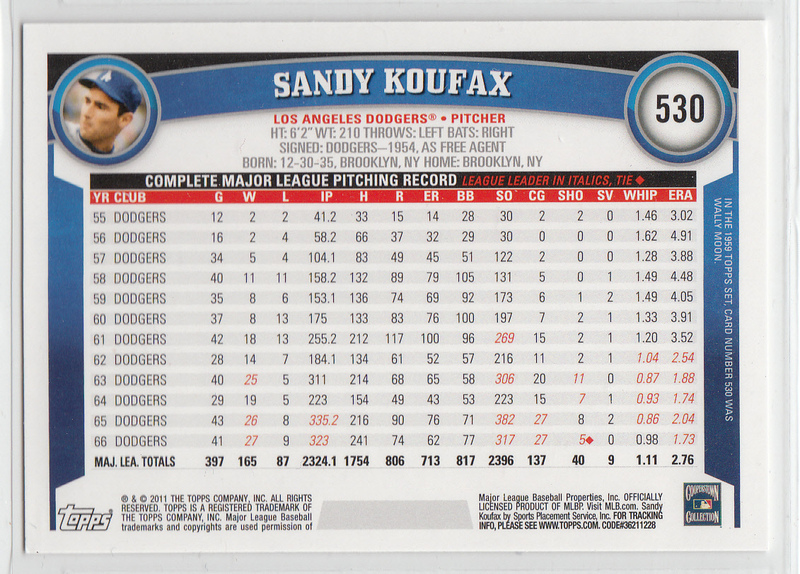 Here is the back side of the Koufax card. 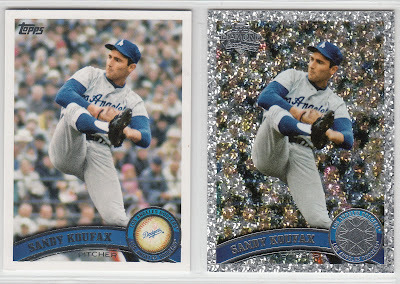 Other than the Platinum Diamond Anniversary parallel there are also a bunch of other parallels available; such as black border, platinum border, printing plates, canary diamond and gold border cards. 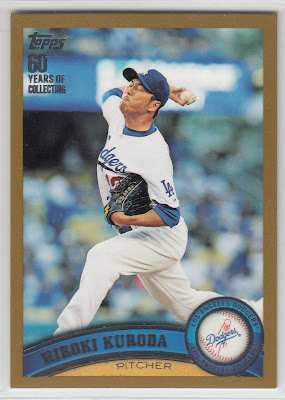 Below is the gold border Hiroki Kuroda card I received. 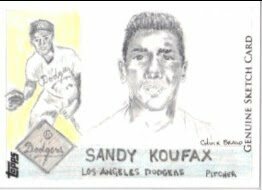 Last week I featured a 2011 Topps Sketch Series 2 card of Sandy Koufax drawn by Baton Rouge artist Chuck Braud. It was his 1956 Topps card, and is up to nearly $200 on eBay. 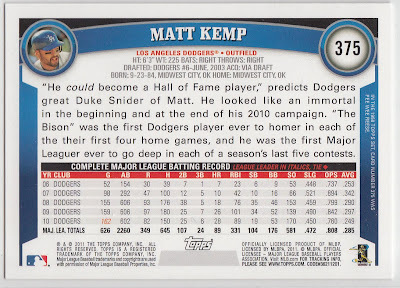 As a result of that post, he shared with me a couple more Dodger sketch cards he made for Topps that have yet to show up online. Check them out below. Here is a 1960 Topps card drawing of Sandy Koufax. 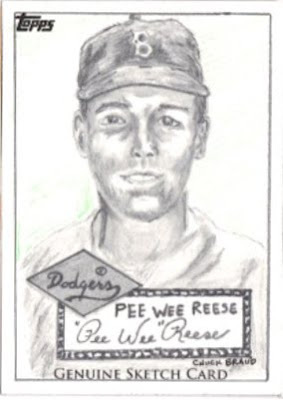 Here is a really nice 1952 Topps card of Pee Wee Reese. Thank you, Chuck, for passing these along.